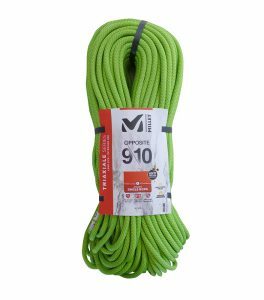 Field test review of the Millet Opposite TRX 9/10, a rope that is part 9mm for redpointing, and part 10mm for working a route. The Millet Opposite TRX 9/10 is part 9mm for redpointing, and part 10mm for more durability to work a route. This 80-meter cord is broken into two sections of different diameters: 30 meters are 10mm and 50 meters are 9mm. In theory, this allows a chintzy sport climber like me to weasel two ropes out of one. Work your project—take lots of falls, lower repeatedly—with the thicker side of the rope, while saving the thin side for sending. In practice, the theory proves true. Flipping to the 9mm side allows you an instant advantage since the rope is lighter and glides more easily through the gear. With pitches getting longer, having a light rope for redpointing is becoming more important and this is a light, versatile rope with a nice supple hand. The change in diameter is hardly noticeable as it passes through the device. 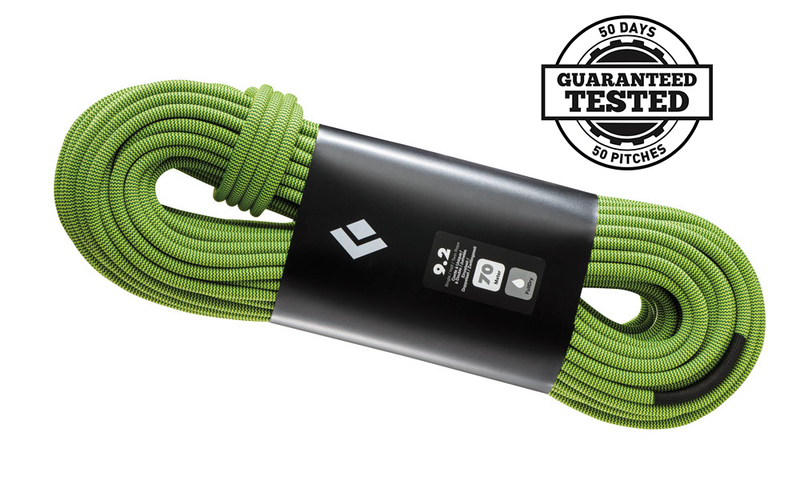 It’s a dry-treated (hydrophobic) rope, but unlike some brands, the rope’s sheath isn’t so slick that it becomes difficult to control with a Grigri when the rope gets thin. The Triaxiale technology includes a beefier sheath (in contrast to a thinner sheath sometimes used to create smaller-diameter ropes), a stabilized diameter that Millet says won’t fatten up over time and a unique braided core. Millet divides the core into several braids instead of just one and claims that this Triaxiale Technology adds extra safety. ABOUT THE RATING I gave the Opposite 4 stars because it’s a unique product that works. The dual diameter effectively provides two ropes in one. It’s a little heavy, but that weight comes from a beefier sheath. It’s also affordable. • Unique dual diameter rope optimizes both working and redpointing. • 63 grams per meter. • Holds eight CE test falls and has a maximum impact force of 8.2 kN. 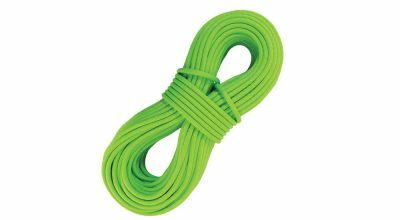 • Unique braided core could provide extra security in a cut-rope situation.